The coat of arms of the city of Grigoriopol was approved in 1794. The description of the coat of arms is as follows: "Quarterly parted escutcheon with chef, small overall inescutcheon and enté en point escutcheon. on golden chief the state coat of arms [of the Czarist Empire], and centrally, on small overall inescutcheon - the image of the Saviour not done by man's hand; enté en point escutcheon in mantle is charged on silver field with golden crown laid on purple pillow. I, green, little lamb bearing flag; II, red - an eagle holding scepter in talons; III, red - lion left; IV, green - silver mountains with leaning flag." (information from article "Moldavian Territorial Heraldry in the Russian Empire", by Silviu Andrieş-Tabac, published in volume Cercetări numismatice VII, Bucharest, 1996). The city of Grigoriopol was founded in the very year of the westward movement of the Russian border to the line of River Nistru - 1792, with the approval of empress Catherine II. 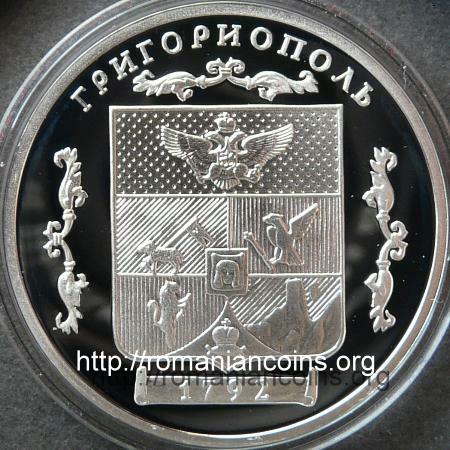 The city was founded on the bank of Nistru at request of Armenian bishop Joseph Argutian (1743-1801). Initially the city was an Armenian colony and has enjoyed fiscal, commercial and religious privileges. Nowadays the city of Grigoriopol hosts about 11,000 inhabitants. Just a few tens of Armenians still live today in Grigoriopol. The denomination of Grigoriopol - city of Gregory - can root from the name of field marshal Grigory Potyomkin, head of the Russian army during the Russian Turkish War between 1787 - 1792. It could also come from the name of Saint Gregory the Illuminator (the one who has christened Armenia). The Greek ending -pol is due to the Russians' fascination over the vestiges of the ancient Greek civilization upon which they had stumbled while expanding the empire east and soutward. A fascination which is to be accounted to names given to new settlements in the nearby or farther away Transnistria: Tiraspol, Odessa, Ovidiopol (1792), Kherson (1788), Eupatoria, Leukopol, Sevastopol, Simferopol, Phanagoria, Theodosia, Olbiopol (1781). 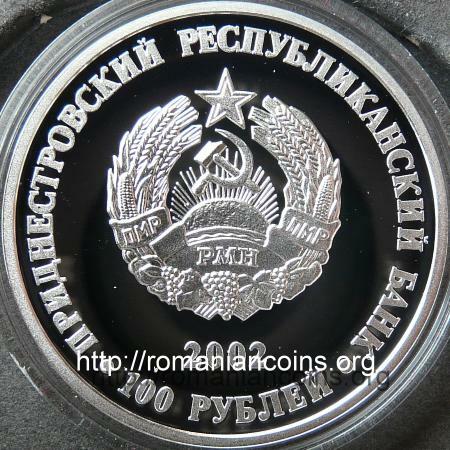 There are coins issued by Transnistria. Knowing one might rightfully be wondering what is Transnistria about, we tried to depict on the site the issue as best as we could. Click the links below to clarify yourself.